EndoClot Plus provides an innovative powder delivery system to enable endoscopists to spray the AMP® power directly to the designated site via the working channel of an endoscope. The innovative applicator includes a delivery catheter and a specially designed powder/air mixing chamber that is connected to the powder dispenser and the EndoClot® Air Compressor. 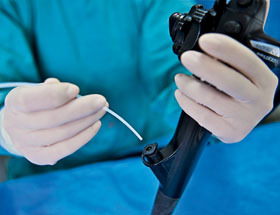 The delivery catheter is inserted into the endoscope and positioned toward the lesion in the gastrointestinal tract. Pressure coming from the air compressor propels the powder through the catheter directly to the designated area. The unique anti-reflux design prevents occlusion. Due to the long working channel of the endoscopes, it is usually very difficult to deliver or inject gel or solutions with high viscosity into the GI tract via endoscope. EndoClot Plus designed and developed a unique syringe with spiral plunger to overcome this problem. The spiral plunger syringe is compatible with any available sterile endoscopic injection needles on the market. Patent pending in the U.S. and other countries.